^ The ۔eu domain is also used, as it is shared with other European Union member states. 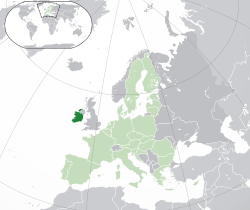 ↑ Prior to 2002, Ireland used the punt (Irish pound) as its circulated currency. The euro was introduced as an accounting currency in 1999.